Remember when Arnold Schwarzenegger took that break from acting to go save the state of California or something? Well, it's still there so he must've done a pretty good job. Seems like a lifetime ago, doesn't it? And since his comeback the best roles Arnold has taken haven't been rehashes of former glory, they've gone in completely different directions. Do we really need to see him play the hero again? Fortunately, the action-comedy Killing Gunther does something we rarely have had a chance to do, and that's have Arnold play the bad guy. A wildly over-the-top, silly, but still sorta deadly bad guy. In SNL vet Taran Killam's directorial debut, Arnold gets to go buck wild crazy as Gunther, the greatest hitman in the world. It's a performance unlike anything we've seen from Arnold, and I've seen Twins. A lot. Gunther is like every Arnold action cliché ever, if the writers were high as Hell. He references his past terrible one-liners, cackles madly while firing huge guns, dresses in lederhosen for incomprehensible reasons, and...man, I don't think he's ever had this much fun. I don't know what's going on with his hair, either. Arnold's stogie-chomping, pimp suit-wearing madcap performance is the best, and pretty much only reason to check this film out. The problem is he's only on screen for about 20 minutes. Tops. He doesn't show up until after the first hour. He's basically a boogeyman up to that point, one that pompous assassin Blake (Killam) wants to kill. So he hires a documentary crew to follow him around as he tries to expose then murder Gunther, joined by a team of like-minded killers with special skills that should make failure impossible. Hannah Simone is Sanaa, a skilled sharpshooter and the most serious member of the team; Bobby Moynihan is Donnie, an explosives expert; Aaron Yoo scores the most laughs out of this bunch as Yong, a master of poisons impractically carrying a stash of them under his coat. How much use he is in a firefight becomes hilariously clear pretty quick. While the killer crew has a few moments where they might be worth a chuckle, it's not nearly enough for such a talented cast. And a big part of the problem is their characters are pretty dull outside of whatever their core flaw is, and they all prove so inept it's a wonder they were ever considered top mercenaries to begin with. Plus, the mockumentary aspect adds little, coming across as a contrivance to cover for the lack of funny one-liners. It only pays off in the final scene, which again, is largely due to Arnold acting like a madman. And why in the world would assassins want to be filmed, anyway? I guess that question's out of bounds because this isn't a movie complying with the rules of logic and reason, but if I laughed more it never would've crossed my mind. 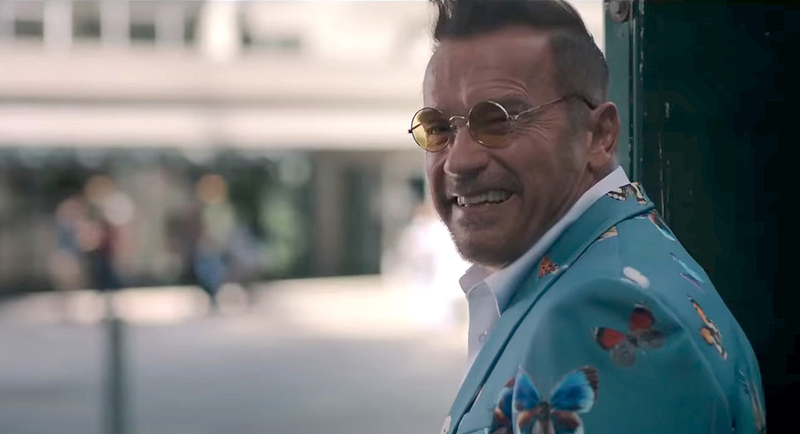 Most of Killing Gunther misses the target badly, but by casting Arnold Schwarzenegger in one of the craziest roles of his career, at least he's able to come to the rescue one more time.